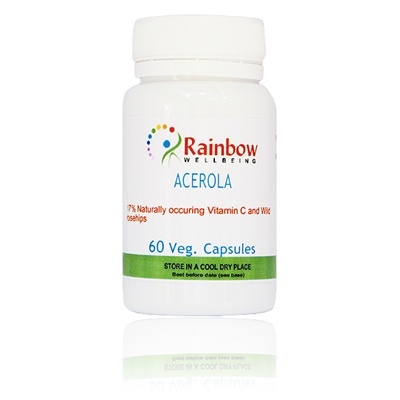 Each vegetable capsule provides 250mg Acerola extract with 17% naturally occuring vitamin C plus 250mg of wild crafted whole rosehip. 100% pure ingredients no additives of any kind. Acerola Cherry contains a rich mix of bioflavonoids and anti-oxidants, a food state vitamin C easily absorbed. Valued for its gentle action and superior effectiveness, compared with isolated vitamin C.
It is one of the few products on the market that is retained by your body and not rapidly excreted. The fruit of the Acerola Cherry is one of the richest-known sources of vitamin C.
Acerola also contains an array of bioflavonoids, vitamins, minerals and other phyto-nutrients, making it an ideal food-based source of nutrition. The free radical scavenging benefits are also useful for lessening the tendency to degenerative disease & cellular aging. When we first take a tonic such as Acerola, a wonderful energy enters the system, conversely taking large doses of vitamin C can lead to imbalances. 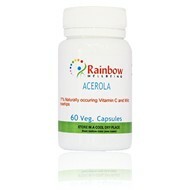 Each vegetable capsules contains 250mg Acerola extract with 17% naturally occuring vitamin C and 250mg of wild crafted whole rosehip. No other ingredient or additive.